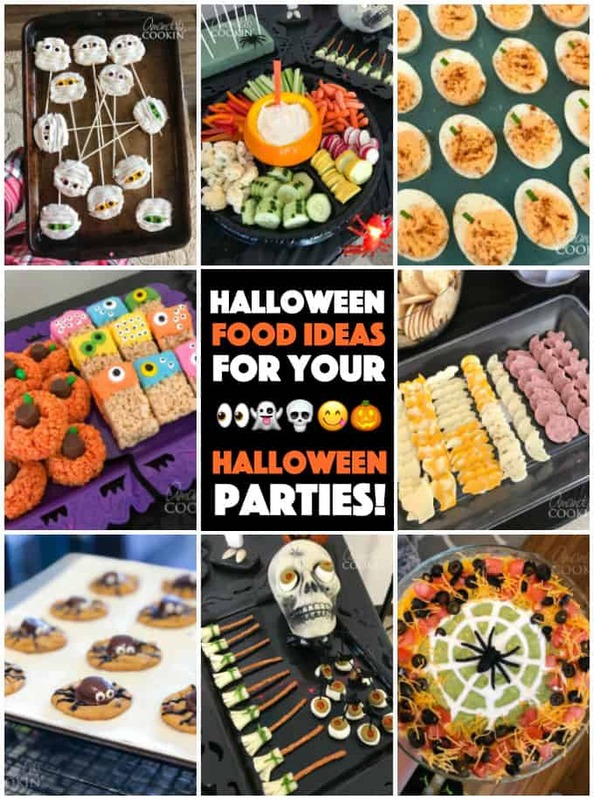 When I hosted my pumpkin painting party last year, I was all over the web looking for fun Halloween food ideas. 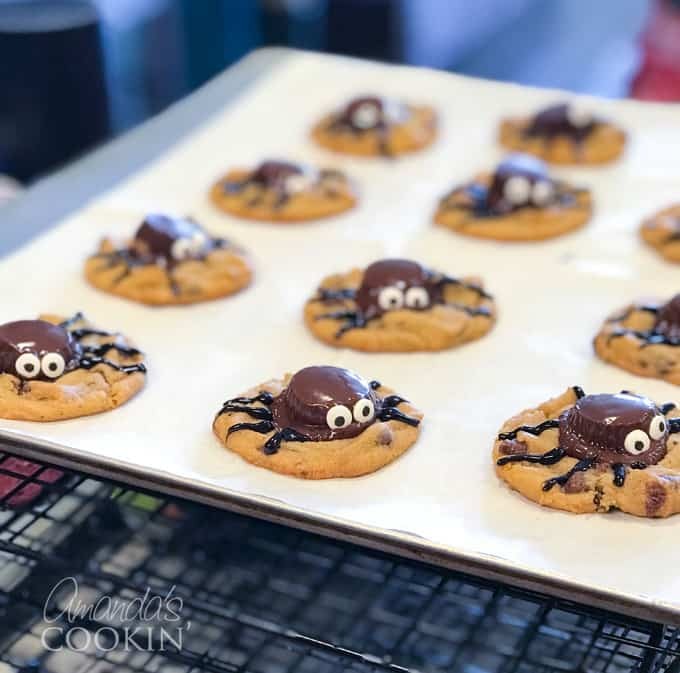 There are so many fun Halloween party recipes, so we made as many as time would allow. Here are the treats we went with. When I bought my house earlier this year I decided to move out of my craft studio and bring it into my home. But before closing up shop, I hosted a pumpkin painting party for some fun friends. My daughter and I get a little crazy when it comes to planning parties, so we made tons of food. Here’s what we came up with! 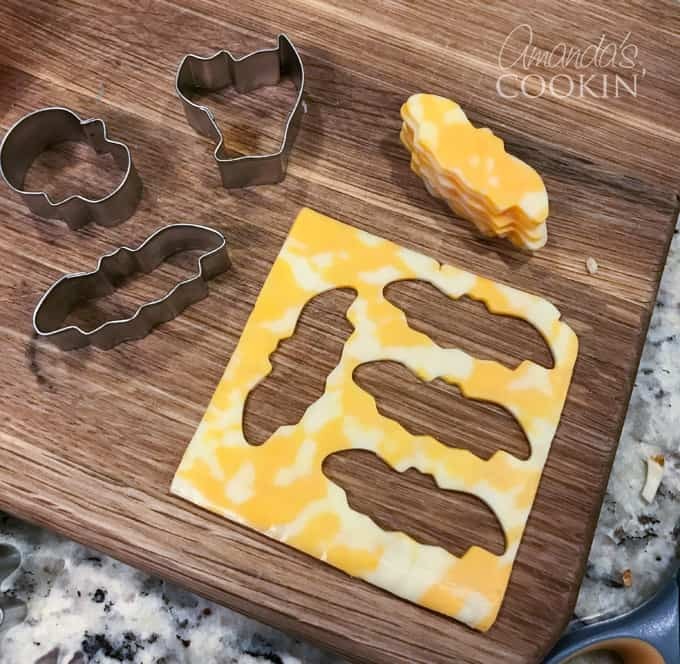 Cookie Cutter Cheese & Sausage – Someone uploaded a photo to Pinterest showing this idea. 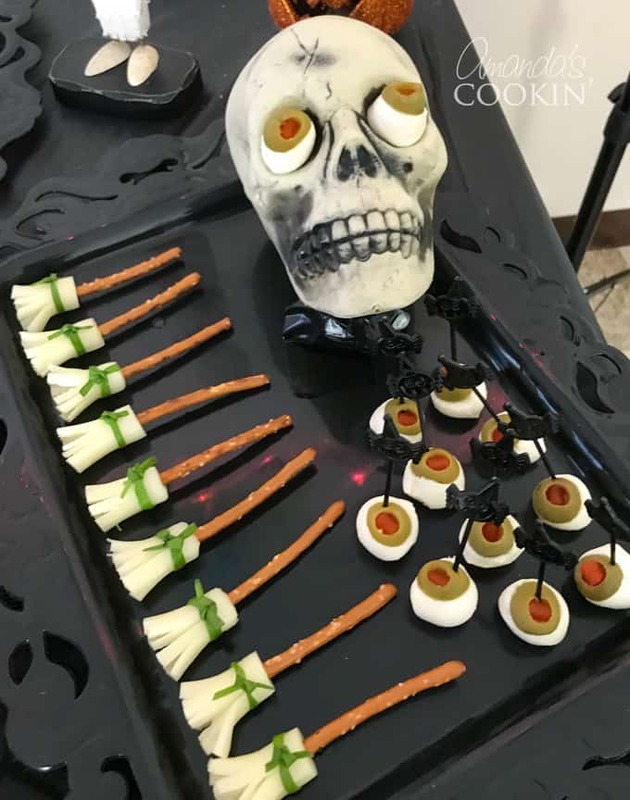 So simple, and I already had the Halloween mini cookie cutters! 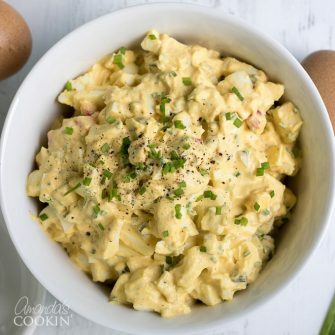 Pumpkin Deviled Eggs – This was an idea without a recipe, but I was able to find one here. However, I didn’t use pumpkin at all as the recipe calls for. I just added a tiny bit of red gel food coloring to the egg yolks to turn it orange. Sprinkled paprika and a snipped chive top them off! 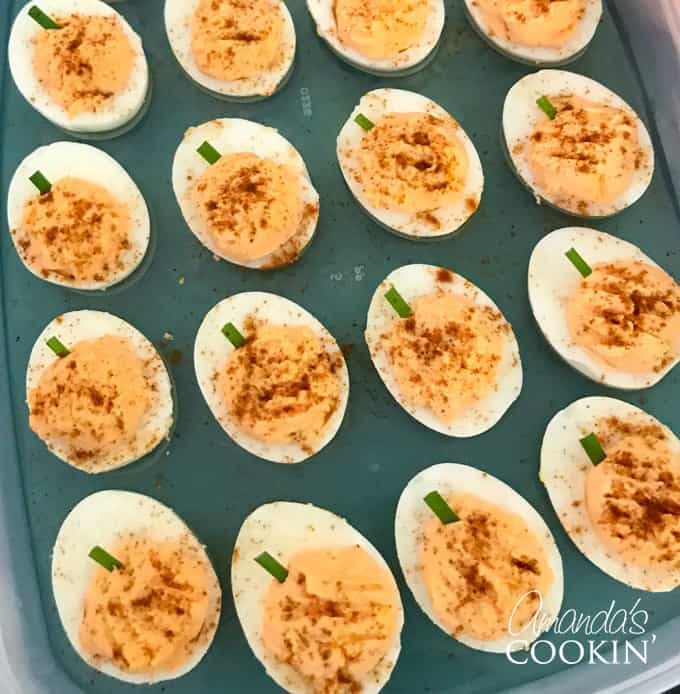 Mozzarella Eyeballs – I actually found this idea from Giant Eagle, but I checked their site and the recipe is gone now. I bought a plastic skull from the dollar store, then sliced the top off of green olives with pimentos and put them on top of mozzarella balls. 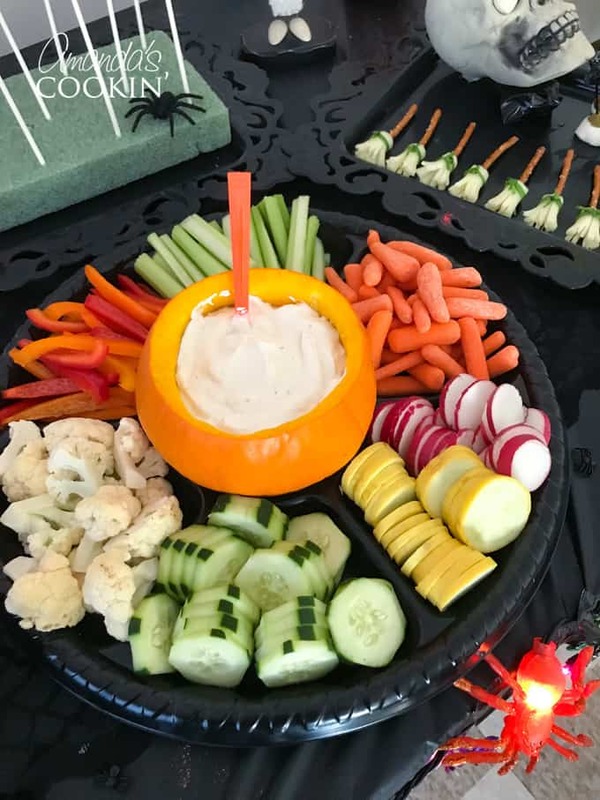 Veggies and Dip in a Pumpkin – So simple, get a pie pumpkin, cut off the top, and clean out the innards. Fill with your favorite dip or make our homemade buttermilk ranch dressing and surround with fresh vegetables! 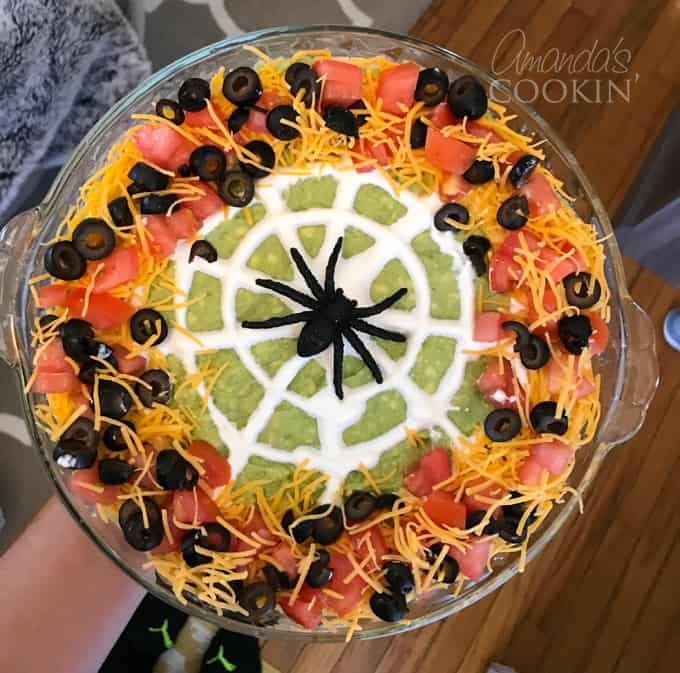 Spider Bowl with Hummus – This is such a simple and cute idea. 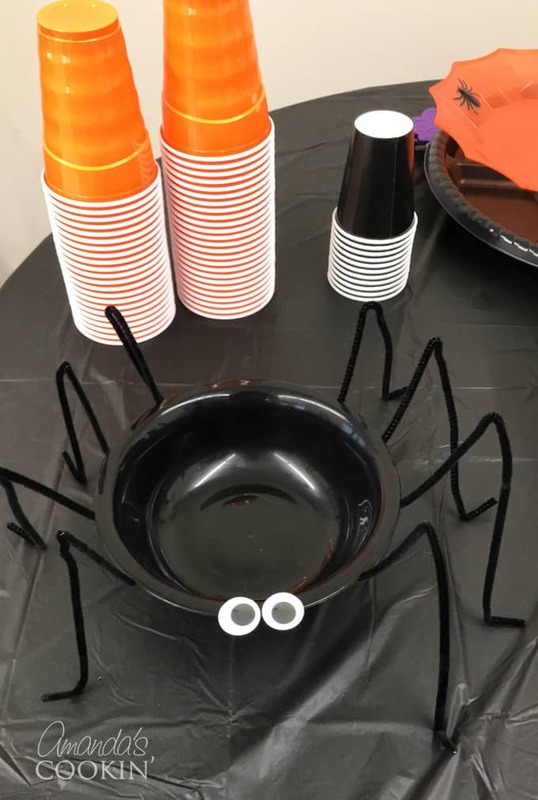 We bought a few black plastic bowls from the dollar store and taped black pipe cleaner legs under the rim. 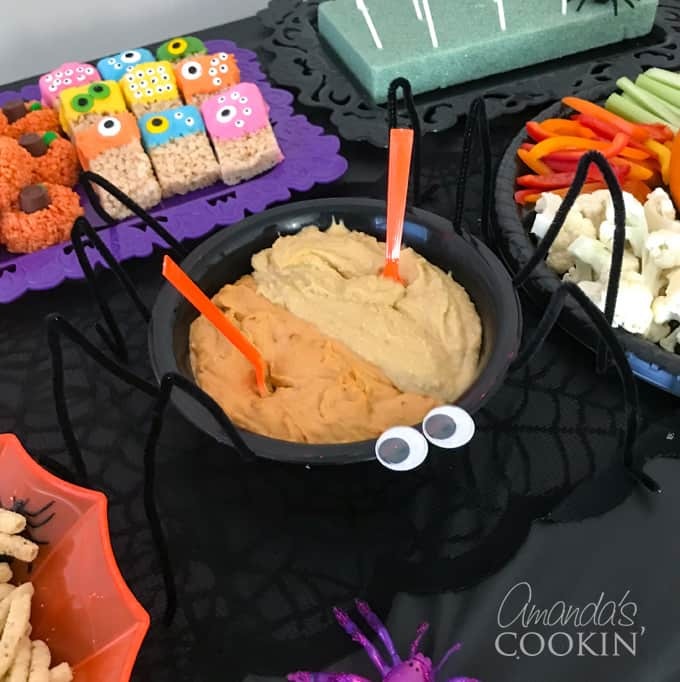 use glue dots to attach a couple large googly eyes and fill with dip (we used two flavors of hummus). Popcorn in Halloween bags – I have a popcorn machine so we picked up some Halloween themed popcorn bags and filled enough in case anyone wanted to take some home. 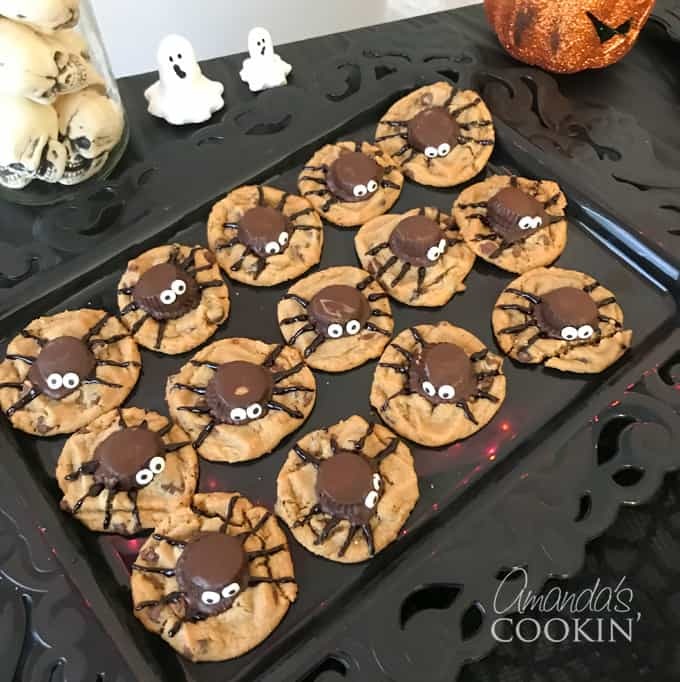 Spider Cookies – Our spiders are melted (oops) because I added them too soon to the cooling cookies. I used my peanut butter cookie recipe and drew my inspiration from here. Rice Krispie Treat Pumpkins – These are super cute and really easy to make. I’ve seen other ones that use Tootsie Rolls or pretzel rods as the stem. Ours used Rolos like this recipe. 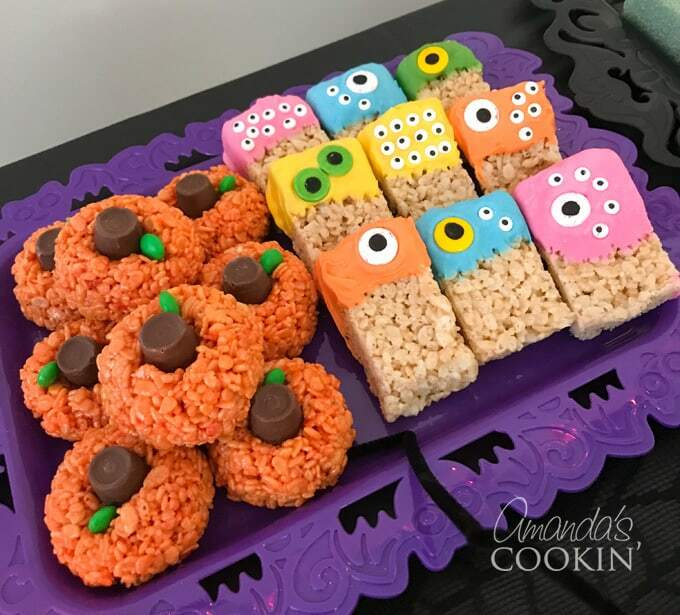 Rice Krispie Treat Monsters – Oh my gosh, what cuties! We went crazy and made several colors, but you could just stick with a couple. Here’s how to make them. 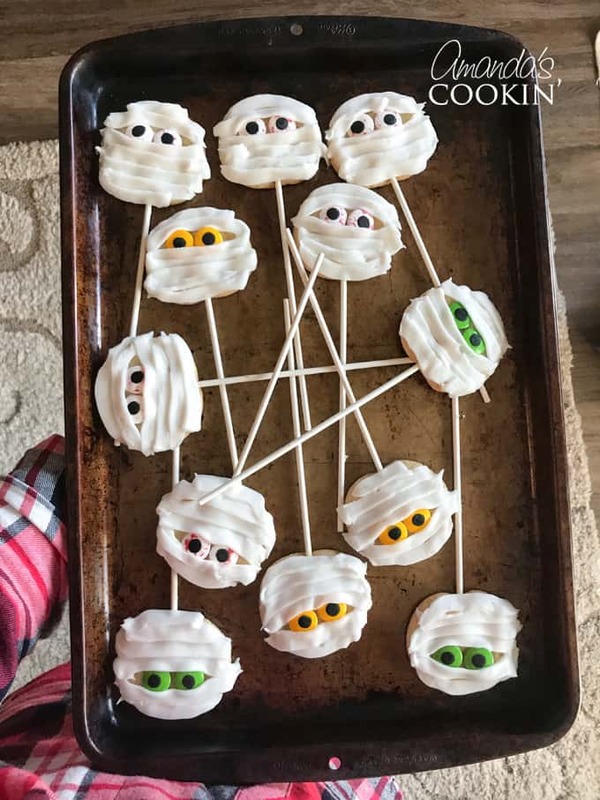 Mummy Cookies – I used refrigerator cookie dough and a canned white frosting to make the bandages. I thickened the frosting with powdered sugar and used a flat piping tip. I was also able to find fun bloodshot candy eyes! I used the 6-inch lollipop sticks for these and used a piece of floral styrofoam to display them. 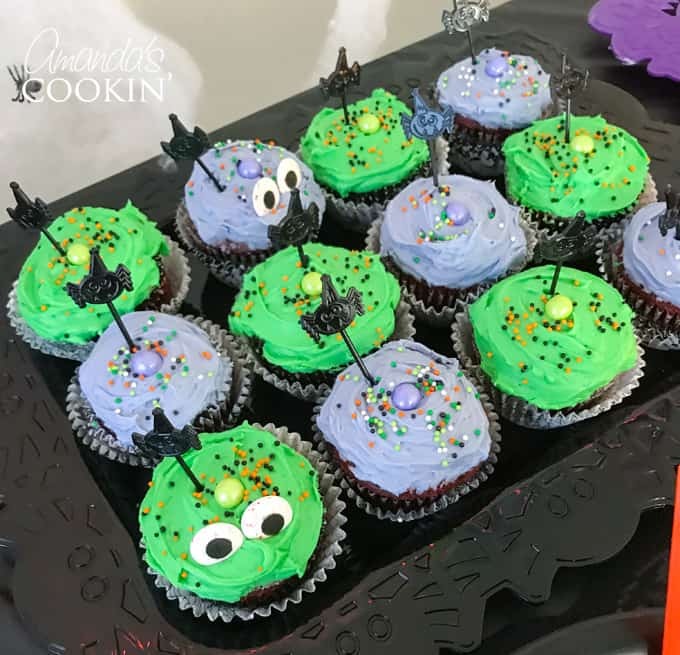 Cupcakes – We baked a simple chocolate cake mix into cupcakes and tinted some white canned frosting with purple and green gel food coloring. After topping with some fun sprinkles we added some candy eyeballs and called it a day. 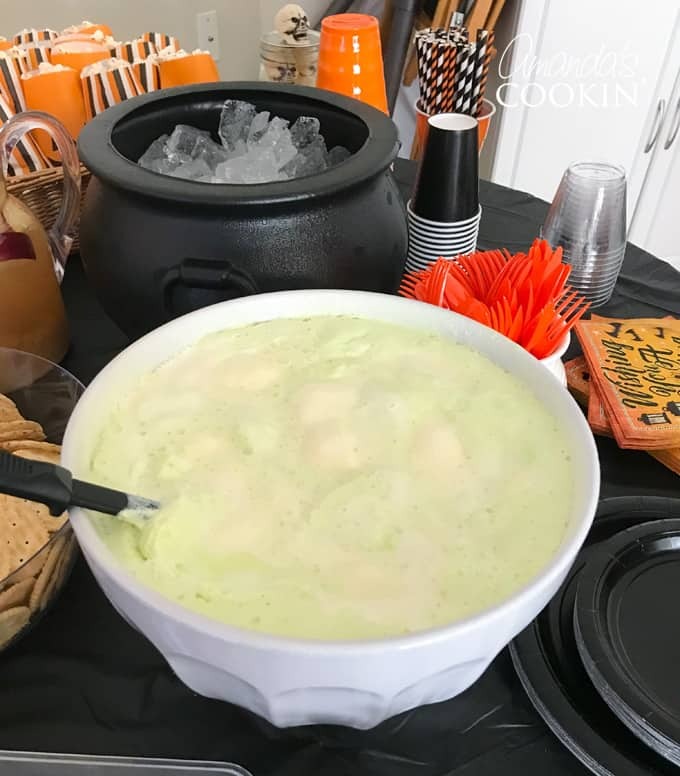 Swamp Potion – For this non-alcoholic Halloween punch you mix Kool-Aid with green sherbet. However, we were unable to find green sherbet anywhere so we went with vanilla ice cream instead. We used this recipe but also added in Sprite. 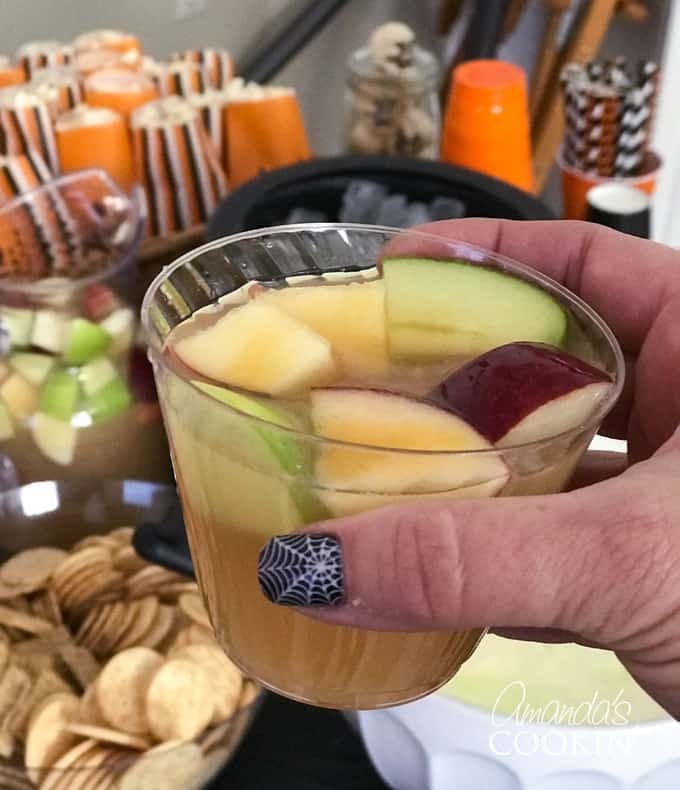 Caramel Apple Sangria – This alcoholic beverage was a huge hit! Such a pretty presentation and it was so delicious! Everyone commented they were unable to tell they were even drinking alcohol. Here’s the recipe. 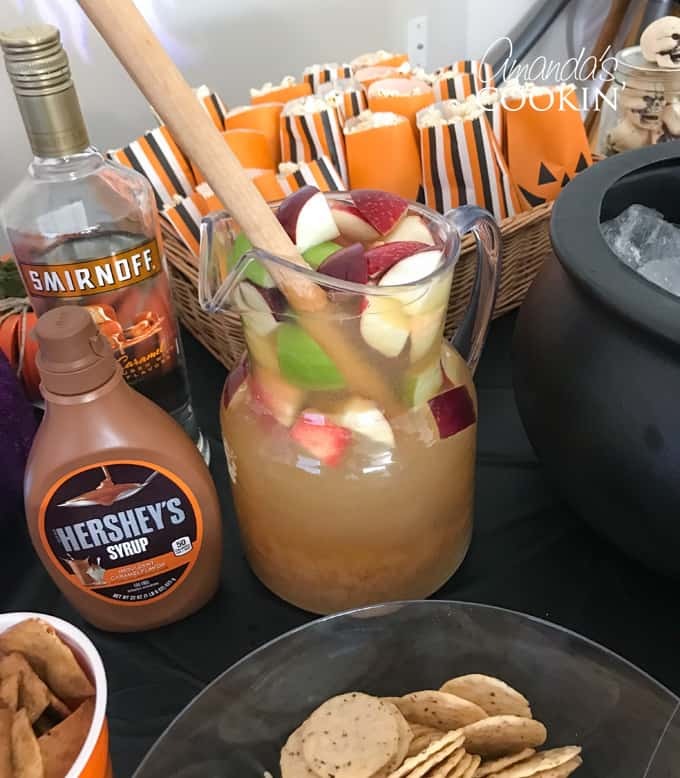 Witch’s Cauldron – you can usually find these simple black plastic cauldrons at dollar stores or WalMart and they were great for holding chips and Halloween candy. We used ours to hold ice for the sangria. 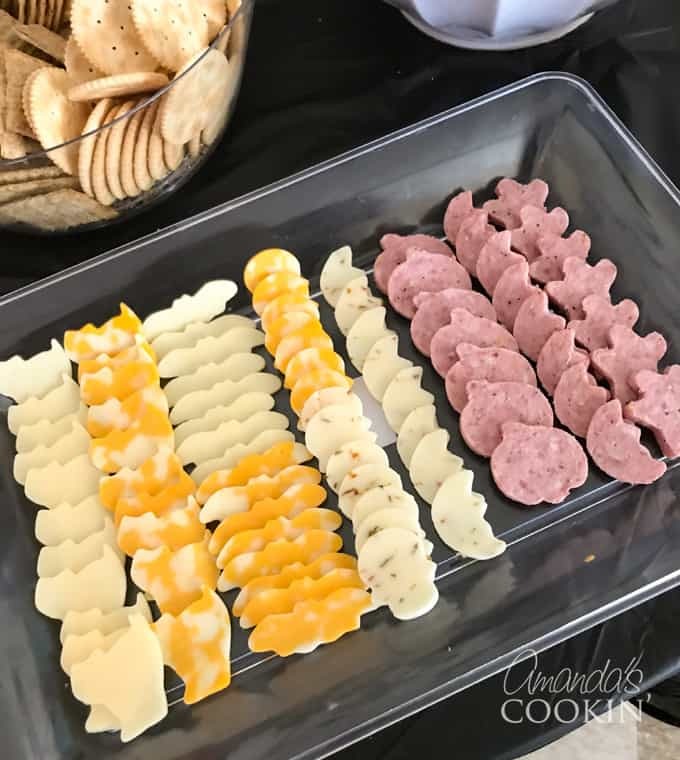 While we didn’t use any of these for this particular party, we have definitely made them before! 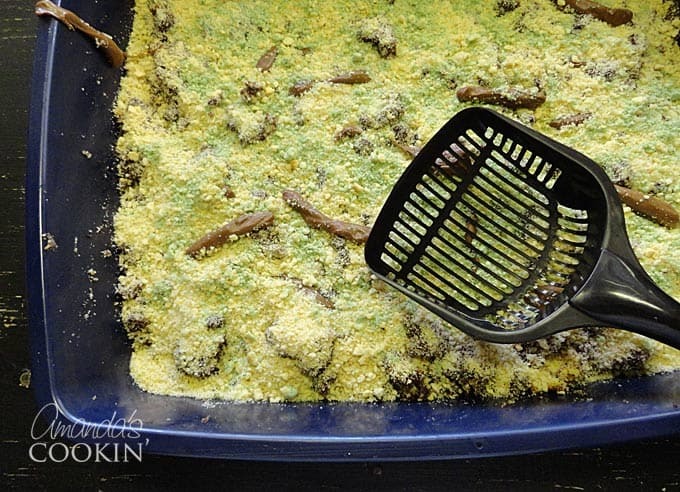 My deliciously disgusting Kitty Litter Cake is always a huge hit at Halloween parties! People on Facebook are always asking “why? !” – trick or treat! This is the trick, and it’s great fun! 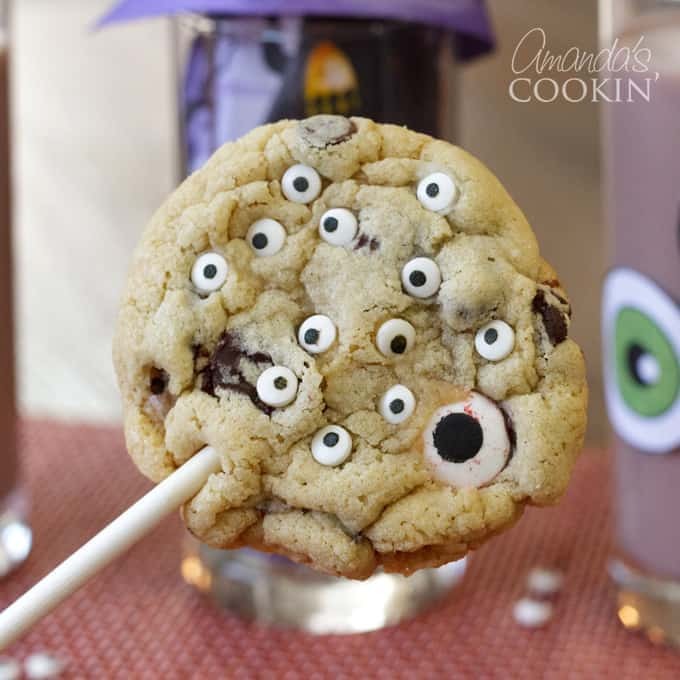 These monster eyeball cookie pops make the perfect Halloween party treat. 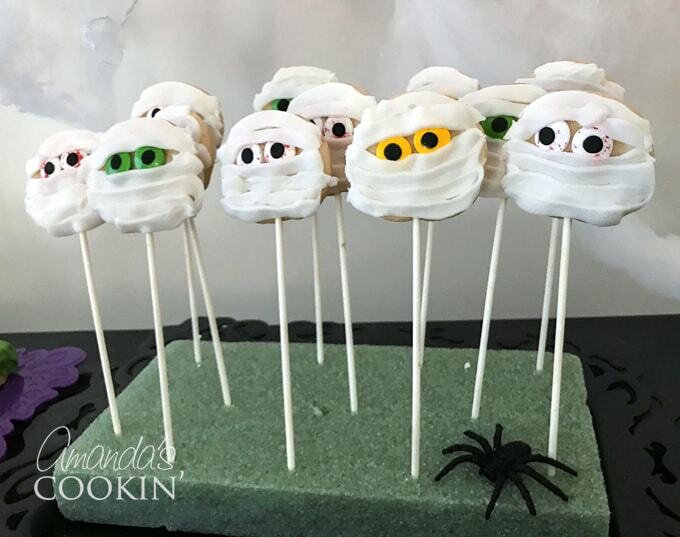 Place them on sticks and you have a cute-yet creepy- Halloween dessert idea! Another gross idea that kids giggle over are these Boogers on a Stick. Pretzels sticks dipped in green tinted Velveeta cheese! 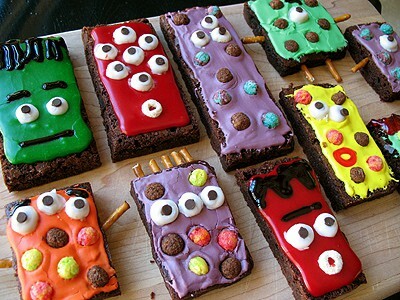 I made these adorable Monster Brownies several years ago. The colors are so fun and everyone loves them. 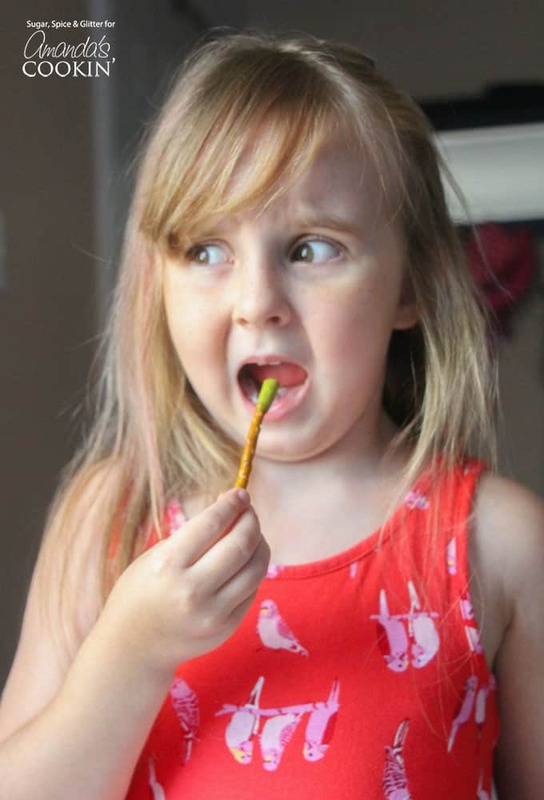 Kids don’t want to eat their veggies? 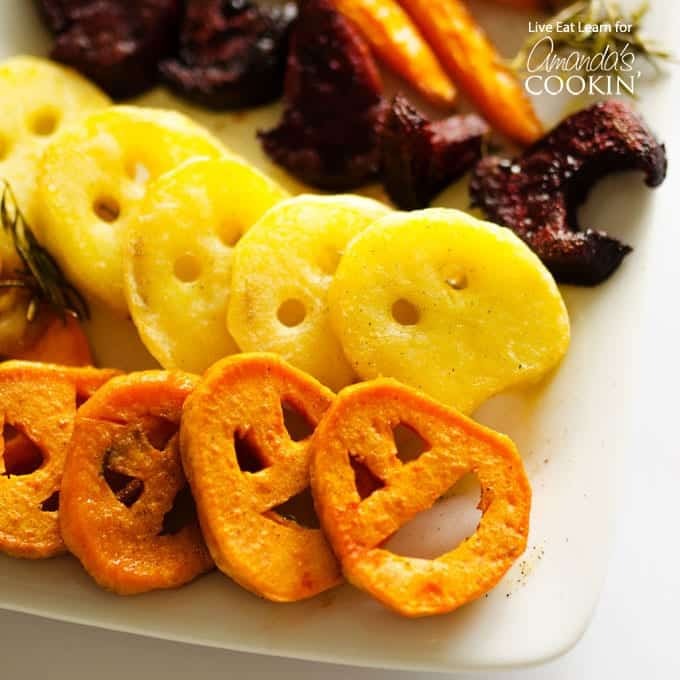 Make them these roasted Halloween vegetables and they’ll gobble them up! 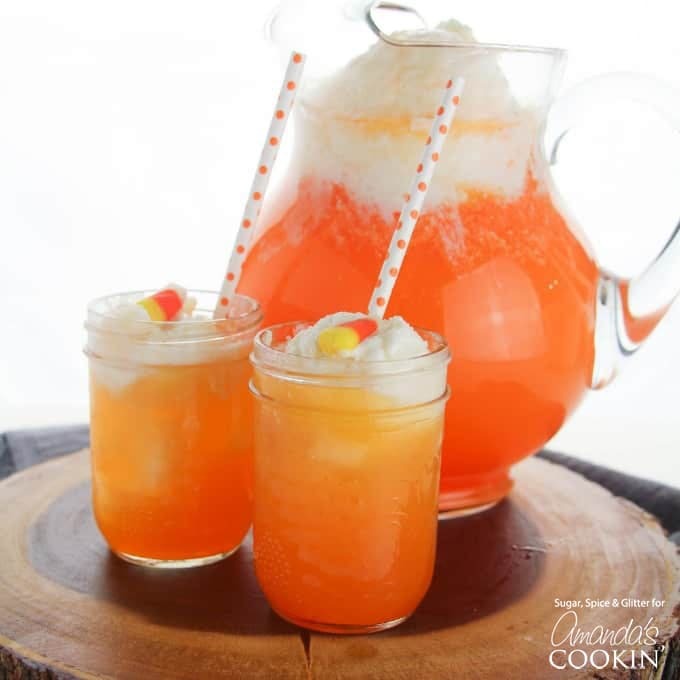 Candy Corn Punch is perfect for fall get-togethers with friends or a Halloween party. It’s non-alcoholic too, so the kids can enjoy it as well! 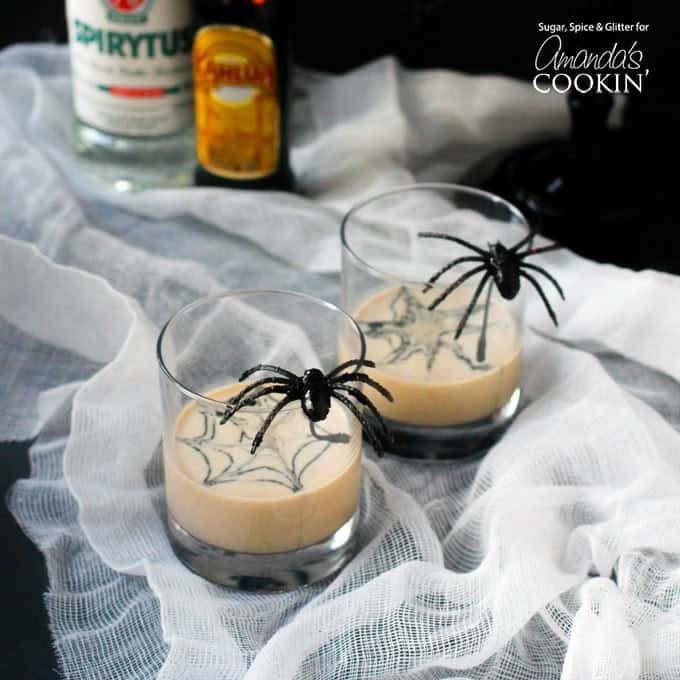 For the grown-ups we have a Spiderweb Cream Cocktail, this Raven Coffee Cocktail, and our Caramel Pumpkin Cocktail! Hope you have fun at your Halloween party! Check out my craft blog if you need Halloween craft ideas, DIY Halloween decorations, or Halloween party ideas for kids!